WILLIAM THOMAS RILEY was born in Skipton in Craven, Yorkshire, and christened there on 11 September 1842, near the start of Queen Victoria’s reign. He was the son of William Riley and Ann Harrison. 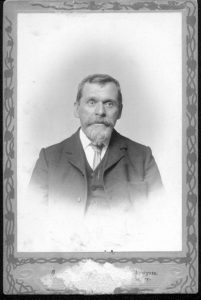 His family moved to Burnley between 1845, when his younger sister was baptised in Skipton, and 1851. 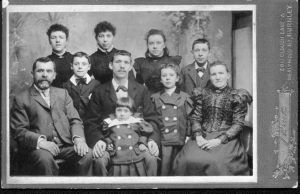 In the 1851 census, 8-year-old William is the fifth of six children living with his parents at 102 White Lion Street in Burnley. His father is an overlooker in a cotton mill and William’s two teenage brothers are also working at cotton spinning. He and his family have not been found in the 1861 census. William was already a widower when he married Sarah Hargreaves. His first wife was Elizabeth Crossland. She married William Thomas Riley in the second quarter of 1868 in the Burnley district. Elizabeth appears in the 1861 census living in Habergham Eaves with her parents and six siblings. Her father was a coal miner. Her mother’s name was Martha A. Judging from the children’s birthplaces, the family had lived a peripatetic life, Elizabeth was born in Bellingham, Northumberland. At the time of the 1861 census she was 13 years old and a Cotton Power Loom Weaver, as were her two elder sisters. William was left with his infant daughter. They moved to Berwick Street. Martha Ann lived only a matter of months. She was buried in Burnley Cemetery on 6 Dec 1871 in grave 11082. SARAH HARGREAVES was born in Todmorden, Yorkshire, on 28 May 1850. She was the daughter of James Hargreaves, weaver, and Sarah Buck. The family were then living at Gutroyd, Langfield, between Todmorden and Halifax. At the time of her marriage Sarah was 23, living in Barrack Road and working as a winder. William and Sarah were married by banns at Holy Trinity Church, Habergham Eaves, Burnley, on 4 April 1874. Sarah’s father is recorded as ‘James Hargreaves, Deceased’. William was 31 at the time of his marriage, and a weaver. Their children were born in Burnley. At the 1881 census William is aged 38 and a cotton weaver. Sarah is 30 and a cotton winder. The couple are living with their first three children, Tom, Emma and Annie, at 26 Roebuck Street, Habergham Eaves. Tom, born in Burnley in 1875. Baptised in Habergham Eaves on 5 Mar 1882 on the same day as his younger sister Ada. 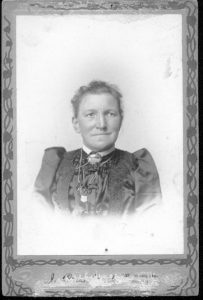 Emma, born in Burnley c. 1877-8. Annie, born 12 September 1879. Ada, christened 5 Mar 1882 at Habergham Eaves, between Burnley and Padiham. Harry, born 1888-9. Edith Tootle said that Annie Riley had an illegitimate son called Harry, who was brought up as Annie’s brother and died at the end of the first world war. However, when this Harry Riley was born Annie would only have been 10. Sarah Ann, born 1891, who died aged 17. The family were still at the same address in 1891. Sarah’s birthplace is given as Gutter Hole. William left the cotton mill for a while. In the 1901 census, he is working as a grocer’s assistant. It may have been an accident or illness which prevented him from continuing work with the weaving machines. All the older children are working as cotton weavers. The family had moved to St John’s Road. 1901 Census. 22A St John’s Road, Lowerhouse, Burnley. Methodist Church was built. Its first stone was laid during the Jubilee celebrations of Bethel Methodist Church in 902. Jubilee opened on Saturday 10 October 1903. In 1904 William was again recorded on his daughter Annie’s wedding certificate as a cotton weaver. The family were still living at 22a St John’s Road, Burnley. By the time of 1911 census he had retired and was still living at St John’s Road, with Sarah, three of their children and a son-in-law.. The census shows that Sarah had been in her present marriage for 36 years and had 9 children from it born alive, of which 7 were still living. It says that none of those registered suffered from an infirmity. William died on 24 May 1913 at the age of 70. He did not live to see the effect of the First World War on his family. Sarah probably lived another three years. The most likely registration of her death is in the first quarter of 1916. She was buried in Burnley Cemetery on 1 March 1916, aged 65, Grave A4863. She had been living at 7 Hartley Street. Riley, Sgt. Thomas, 15666; wounded. 1st July 1916. [20,21C]. He would have been 40 at this time. The youngest, Harry, died in the last year of the war, at the age of 29. PERNES BRITISH CEMETERY, Pas de Calais, France. On 28 March 1910 Ada married Fred Yates. She was a 28-year-old cotton weaver; he was a 29-year-old coalminer. Their son Harry Yates was born in1913. They lived in the family home at 22a St John’s Road, Burnley. On the outbreak of the First World War, Fred Yates joined the Coldstream Guards. He was wounded, and Harry remembers being taken to see him when he was convalescing in hospital in Worksop. He saw his father only once more. Fred Yates is said to have run off with one of the nurses. Ada and young Harry were left in poverty, because Ada could not prove whether her husband was dead or alive. Her sisters would sometimes cook extra food to take round to her. When Harry was in his teens and an apprentice painter and decorator, he came home one day to find a strange man sitting in a chair. He was told, ‘It’s your Dad’. Harry had no wish to know him, and walked out. Harry married Nellie Harker, a primary school teacher. Before their marriage, she was in a shop in Padiham when a man came in and asked about Harry. She was told, ‘That was Fred Yates.’ Harry later learned that he had a sister and three brothers.